This was when we first moved in. We use the living room for the office stuff as well, so we needed a place to store all the office-y stuff. 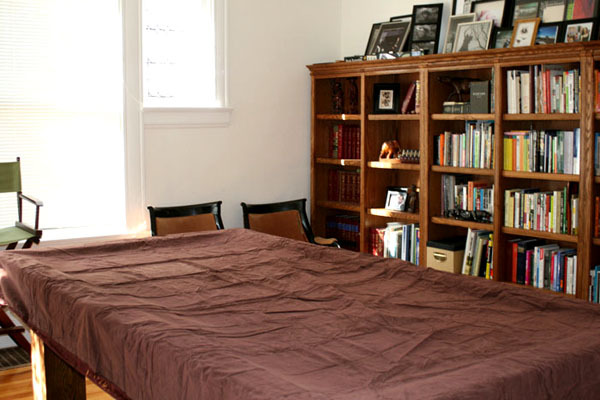 The landlord left the bookcase behind and we thought it would work, but it just looked messy all the time. 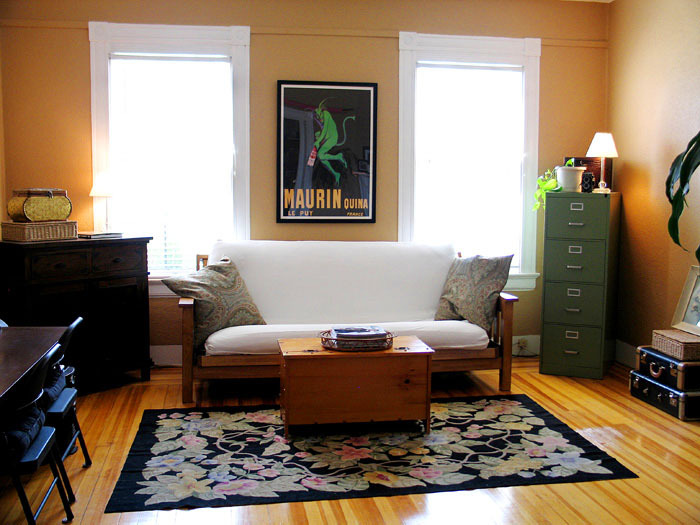 The rug was from the other house and it went well enough here- it goes well with the throw pillows and the vintage filing cabinet. In fact, we didn’t buy anything new for this room. We don’t want to spend a lot of money on an apartment, especially since we already have so much stuff. It seems wasteful and it’s annoying to have to deal with getting rid of the old stuff to make room for the new stuff. 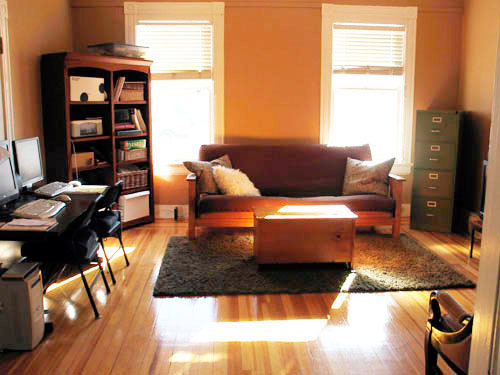 Had the poster, the rug, the futon, the lamps, and the wood cabinet (thanks, Bri!) shipped from L.A. I think it all looks pretty good together. We debated painting the walls but as it turns out, the color looks pretty good with our stuff. 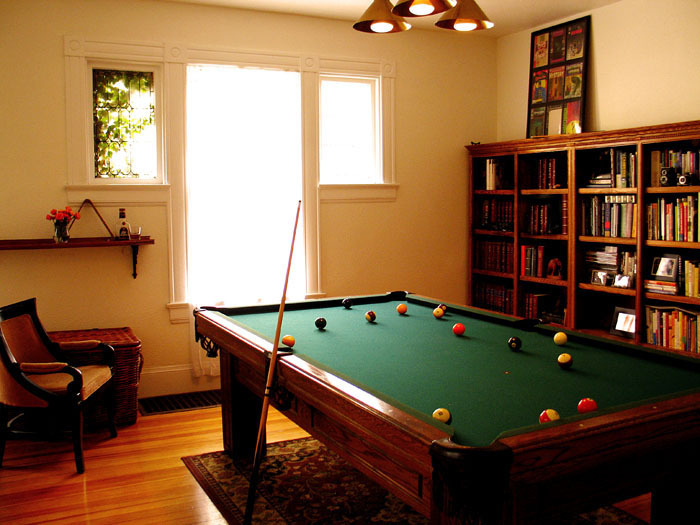 This is the pool room when we moved in. 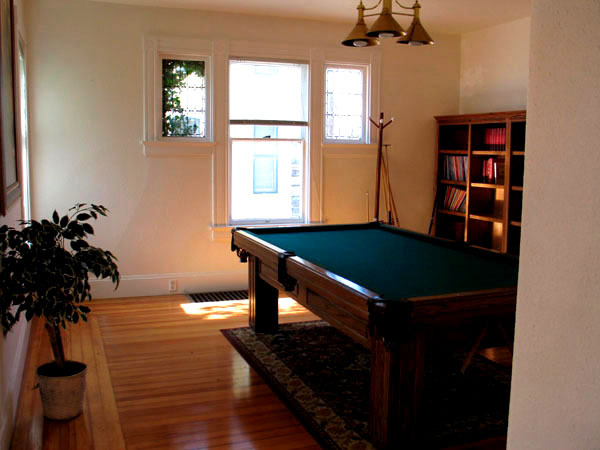 The pool table, the pool cue stand, and the bookcases were left behind by the landlord along with the plant and a big giant piece of art hanging on the wall. This was taken after we unpacked all our books, artwork, photos, etc. But before we edited them down. I also use this room as a sort of dressing room for the Pink Kitty girls, so I had a bunch of wardrobe and other stuff in here. Eventually I got rid of a bunch of PK stuff and put the rest of it into two crates that I can keep in a closet. Keeps this room a lot neater. I liked how it looked when we first moved in, but we do have a lot of stuff that we needed a place for and didn’t want to waste all this square footage so it was all about editing and organizing! We bought the shelf at a salvage yard- it’s perfect for setting down drinks when playing pool. I also switched out the mini blind with a white sheer curtain. We’re thinking about painting this room and making it sort of saloon-like. Not sure exactly what color or how to do that yet.